March 31st @ 11am with a rain date of Sunday, April 1st at 1pm. Easter Egg Hunt Sip on hot coffee, while your little bunnies collect their Easter eggs. 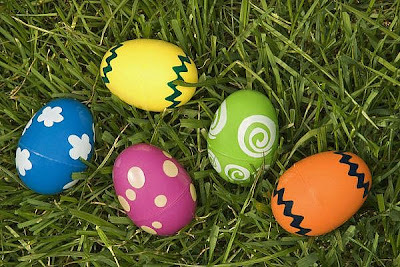 Participate in the Second Annual Decorated Egg contest! Bring your masterpiece to the Pavilion and compete. The people’s choice will be awarded! The Lansdowne Parks and Recreation Board presents its annual Spring Egg Hunt at 1:00 pm at Hoffman Park, featuring a magician, games and prizes. The event is free and open to children ages 3 to 12. Bring your camera to get a picture with the Bunny. Sunday, April 1st 1 PM, Rain or Shine-Brookhaven’s annual Easter Hunt will be held on Sunday, April 1st at 1 PM on the grounds of the municipal center. Pictures with the Easter Bunny will begin at 12-noon. Signups begin on March 12th through March 26th Monday through Friday’s during normal borough business hours. Additional signups Saturday, March 24th from 10 AM to 12 PM and Monday, March 26th from 7 PM to 8 PM. Open to Brookhaven resident children 0-10 years only. You will need a ticket to participate in the hunt. Anyone wishing to volunteer to help stuff the more than 5000 plastic Easter Eggs is asked to come to the municipal center on Tuesday, March 27th at 7 PM. Come join the Media Recreation Board for their first annual Easter Egg Hunt on Saturday, April 7 at 10am on the grounds by the Tot Lot. The annual Easter Luncheon with the Easter Bunny will be held immediately following the hunt in the Community Center from 11am-1pm. Food, fun, and games for everyone. Valley Point Church @ Garnet Valley H.S. 20,000 candy filled eggs, food, moonbounces, prizes galore AND a helicopter!! Prepare to get egged at ValleyPoint Church’s helicopter Egg Drop 2012! 18,000 candy filled plastic Easter eggs will be scattered across the upper soccer fields at Garnet Valley High School in Glen Mills, PA on April 7th. This free event, sponsored by ValleyPoint Church, will feature fun for the entire family including moon bounces, carnival food, face painting, awesome egg hunt prizes AND a helicopter!!! The egg drop is for kids 5th grade and younger. The event registration begins at 11am and the egg drop will happen at 12:00 noon. Children birth- 5th grade will be organized according to their ages/grades into 4 groups, so that every child is guaranteed a fun and safe experience. Then, a helicopter will fly over and drop an additional 2,000 eggs on to the field, while all kids are at a safe viewing distance away. After the helicopter has flown away, each age group will start at a different time slot, but only minutes apart, ensuring each kid has a fair chance of collecting eggs. Every egg contains either candy or grand prizes including iPad 2, Nintendo 3DS, Xbox 360 w/ Kinect, Hd cameras, ipods, Power Wheels, electric scooters, Vtech toys and much more. Over 300 prizes will be up for grabs including the previously mentioned grand prizes and an array of large Easter candy items.